Like any piece of equipment, your pool from time to time will malfunction or be damaged and will need to be repaired or upgraded to maintain your level of enjoyment and also protect your investment. Call California Pool Care for a free quote to service, repair, or upgrade your pool. Our experienced California Pool Care technicians are ready to answer your questions and discuss your alternatives. 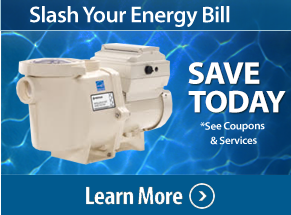 Ask us about our weekly service plan that keeps your pool operating at optimum, efficiency. 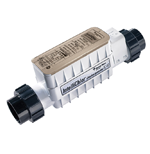 Your pool motor and pump are the heart of your swimming pool system. Some simple but important questions to ask are: Is your motor quiet? Are you satisfied with the quality of your filtration system? Is your pool operating energy efficient? We can have one of our professional technicians make a diagnostic assessment of your pool so that you will have optimum enjoyment and less cost. Give California Pool Care a call and let us give you the right recommendations. Becoming energy efficient is a form of going Green. A variable speed pool pump can slash up to 90% of your pool operating costs over a regular pump that operates at one high speed. We are talking about annual savings of hundreds of dollars in pool maintenance costs. This new technology is so quiet you won’t even know it is on. You may even use the energy calculator to identify your energy savings. A California Pool Care technician can give you additional information on how it can be programmed to meet your needs and save you additional money month after month. 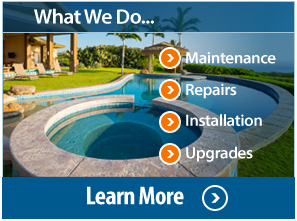 We also will help you with all pool repair and installation needs. Changing filters and backwash cleaning should be part of your regular pool maintenance. Knowing what to do, when to do it, and using the proper tools is a necessity. You can remove this uncertainty when California Pool Care is servicing your pool. Give us a call and let us tell you about our service options from a one time service to a weekly service to meet your specific needs. Changing weather demands that you install the right pool heater to keep your pool at a comfortable temperature and maximize your pool efficiency at the same time. 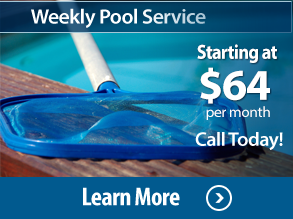 Call California Pool Care for a one time service and inspection if you are not already on our weekly service plan. Eliminate concerns over heating cycles, noise, and a heater that is not firing properly. Have your pool and spa perform just the way you like it. With multiple wireless remote options, indoor control panels keypads, or even from your iPhone or iPad, you will have no more trips to the equipment area. Get the comfort you deserve, for your new pool or adapted to your current pool or spa. Enjoy your pool even more, call California Pool Care today. You can avoid harsh chemicals with a salt water pool system. It may also reduce prep time as an energy saver. You may want to discuss a salt water conversion with our California Pool Care technician. We provide the salinity testing, inspections, and cleanings. Because pool cleaners are in constant use there always is the possibility of a needed repair, rebuilding, or replacing a part or unit. California Pool Care will provide the inspection, and if necessary, complete a proper installation to bring a unit back to its optimum efficiency. We sell and install all models of pool sweeps. Remember that a weekly service plan enables us to catch a deficiency early on before its becomes more of a major problem. Solar Control Systems offers full digital control to the swimming pool solar heating system. The digital thermostat is set with the touch of a button and will monitor the temperature of the pool water and solar collectors. These systems can be added or upgraded to your existing solar system. Call California Pool Care today for more information. Having a light in your pool isn’t just for nighttime safety anymore. Pool lighting has come a long way and you can now get a wide variety of lighting choices to set the right mood for your nighttime swimming. Whether you want standard incandescent or a Energy efficient LED color light that allows you to turn the water into a virtual light show. California Pool Care Can install one for you.